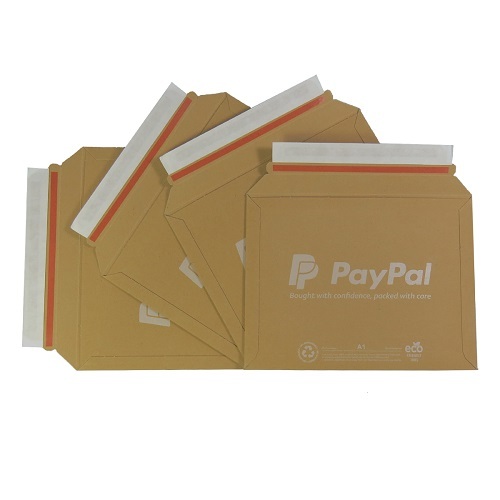 A pack of 100 quality small 'A1' size PayPal branded rigid cardboard Lil envelopes. These are broadly equivalent to size 'D/1' in the bubble envelope range, but an environmentally friendly alternative, that offer better protection. The size of each envelope is 235mm x 180mm - they are 100% rigid and recyclable with peel & seel strips for easy application, and are 450gsm in thickness. They also contain an easy-open tear strip for your customer, to be used once they receive the item. Perfect for sending items the post while securing and protecting the item.